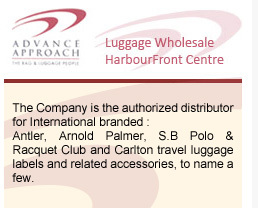 Advance Approach (S) Pte Ltd is a Private Limited Company engaged in the import, local wholesale, retail and regional export of travel luggages and accessories. The Company is the authorized distributor for international branded, President, Antler, Arnold Palmer , Santa Barbara Polo & Racquet Club, International Traveller , MLB and Carlton travel luggage labels and related accessories, to name a few. We import our supplies from notable manufacturers in the region for reexport to customers in ASEAN and other parts of the region. In Singapore our customer base ranges from reputable upmarket department stores to no -frills volume-sales hypermarkets and supermarkets catering to local and foreign clientele with diverse tastes. The Company also provides after-sales support in the form of luggage repair services for its Singapore customers. They repair and service all brands of luggage. Advance Approach (S) Pte Ltd is a Private Limited Company engaged in the import, local wholesale, retail and regional export of travel luggage's and accessories. Agent and distributor of international brands such as US Polo Assn, Santa Barabara, Arnold Palmer..etc. They are also luggage wholesaler and provides luggage repairs service for all brands of luggage too. Where can you find a place to fix your luggage? This is it! not all of the people would change their luggages when its spoilt but here you can try to salvage your luggage and repair!! Huge luggage wholesaler, didn't know they do repairs too.